The new Page Designer has brought with it a number of fundamental changes in how you move around the application builder. If you start playing with property attribute values you'll find when it comes to moving between components & pages, we now have a warning for any unsaved changes. There have certainly been a few times when I wonder if I'm going crazy thinking - did I save? Now I'll know. Though similar I believe to the way Oracle Forms used to behave, currently if the cursor doesn't leave an attribute before selecting another component on the page - it won't get recorded as a change. By the way - you can check out people's feedback on the early adopter so far. I've put in a suggestion to potentially see a list of the outstanding changes we may have forgotten about, or wondering if we can ignore them all. In regard to navigation options, this has probably undergone the most noticable change - I certainly spend a lot of time up there, pressing edit page or opening shared components - or typing a page number in the search widget. This screenshot differs slightly when editing pages - it includes lock & export icons. Amusingly (for me) the shared components icon is a triangle, circle & square - the original name of my blog. I also find it vaguely reminiscent of the old Electronic Arts logo. Unfortunately the page number search doesn't allow entry when in the minimal mode - I presume this is just an early adopter bug. When in the page designer, a swathe of options lies before us - including the all new & important save page and save/run options. 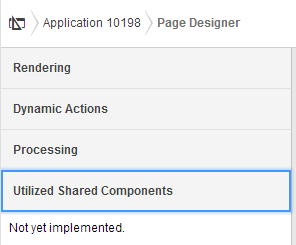 This is starting to feel more & more like Oracle Forms development! In fact, if you're a former Forms programmer - watch this video from David Peake and tell me it doesn't remind you of the old days. 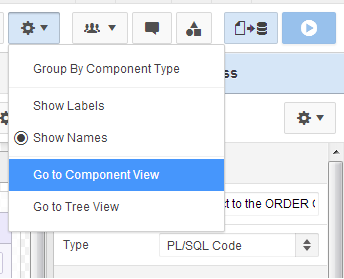 For those like me who might like to occasionally find safety in the refuge of the past, you can find the 4.x Tree View and the 3.x Component View under the cog settings icon - which has been commandeered from shared components. I've been laughed at on Twitter in the past for enjoying the use of the Component View, but I do appreciate & think it's right that the development team kept it in. I think the Group By Component Type is a good option to include, I'd say advocates of the Tree View in particular thought it an essential feature. For me it kinda replaces the panel of icons to limit what we see. To be honest, the only one of these I pressed with any great frequency was the dynamic actions icon. 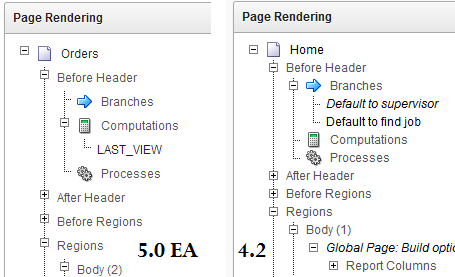 So I feelthis combined with the Page Designer's new accordion shows they got the options balance pretty good. Dynamic actions certainly deserve their own category. 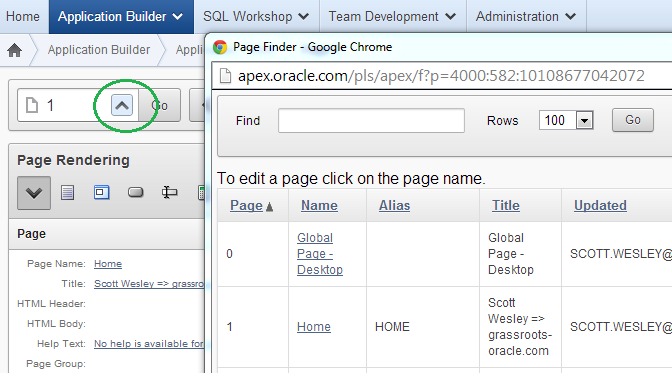 I wonder if the page designer will get it's own pretty icon in the old navigation bar; and what it might look like - perhaps something similar to the old Oracle Designer logo? I want to add I notice the trees in the Tree View have a greater distance between nodes - anyone found that a problem? Maybe not now we have a categorised accordion? You may also notice a few additions in the context menu - I'll bring those up in another post. The rest of the the development environment has stayed pretty much the same - albeit with flatted UI. The Application list; Shared Components; Utilities; Administration; SQL Workshop; Team Development - all have not fundamentally changed. Anyone who used APEX 3.x can attest that date picker popups were annoying. ... and so APEX 5 delivers. In a true test of the new modal page mode, the page finder is a good example of how this can work effectively - though I have requested the search facility auto-refreshes. Interactive Reports now appear to be using this framework, but I won't show any screen-captures because I'd say they need a little more dressing up for EA2. For further detail on using modals for your own applications, check out a post by Joni at iAdvise. Last century it was about saving keystrokes, today it's about saving mouse clicks. And at runtime you'll noticed the toolbar has been enhanced once again. For a start it doesn't take up the entire page width and has an option to auto-hide. The new Quick Edit feature replaces the Show Edit Links option. 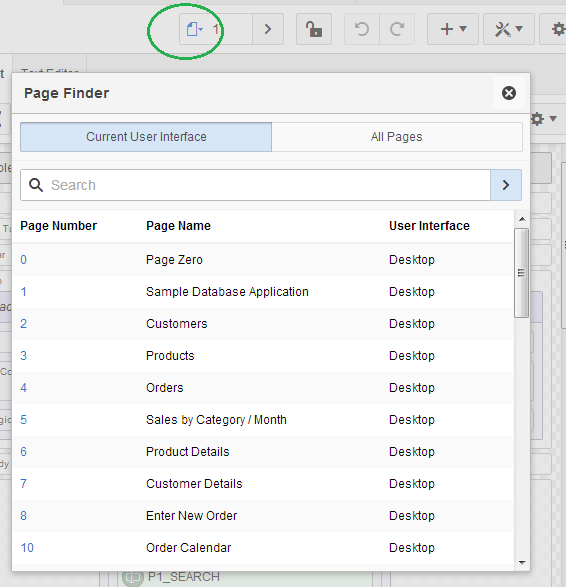 Now it greys out the runtime page and offers you to point a crosshairs cursor at an item or region - it will then jump back to the browser window with your application builder then highlight and open the properties component you select - cool! 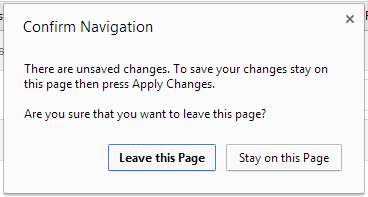 A whole suite of changes and I didn't even have a good look at the new page designer. They all made sense and all we'll need to do is get used to a few new icons - but good progress has been made in helping us be productive.